The Nṛisiṅha-uttara-tâpanîya-Upanishad(Nṛisiṅhapûrvatâpanîyâ) [ 1. ] of the Atharva-Veda sees the Atman with the Om-Sound equal to the Brahman as a cosmisc priciple. This view is inspiredby the basic idea that the Atman only in his highest sixteenth aspect as a subject of knowledge (avikalpa) persists in all its purity. It projects with fifteen subordinate shapes into the world and conditions, the reality and also reality of the the fifteen subordinate forms, which are seen void from the highest standpoint. Advaita denominates the individual souls as Jīvātman. The highest Brahman of the Trimurti is here the Paramātman. The individual Atman(Jivatma) unites from the sight of the Vaishnavas finally with Krishna who is uplifted as the divine Paramatma, which is also a divine body of the enlightened yogin. He is the light-energy of and beyond the "Ishvara-Tattwa", which emanates Sad-Vidya or the "Holy spirit" of the christian bible, the kabbalistic "flash" of the Sephiroth. Kashmir-Shivaism knows thirty-six principles or Tattwas which are divided into three majorgroups which go by the name of Chit, Chit-achit and Achit or pure, pure-impure and impure. 1. The first group includes the first five principles namely, Shiva, Shakti, Sadashiva, Ishvara(with the Param-Atma) and Sadvidya, which contains the Atman. 2. The second group contains the next seven principles: Maya, Kaala, Niyati, Raga, Vidya, Kalaa and Purusha. They are the subtle characteristics of the five grosser elements. Hinduism describes the creation as LILA , the interaction of Purusha and Prakriti. 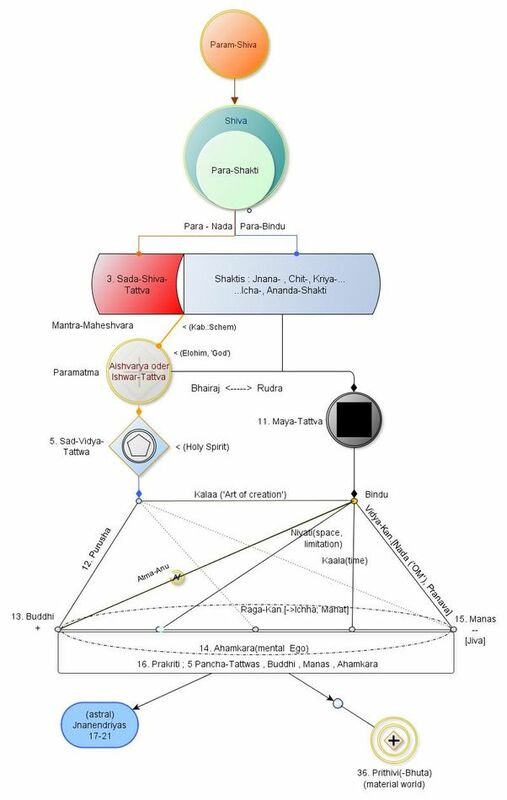 The forces of the buddhic plane are created when Atman interacts with the Maya-Tattwa and causes vibrations - the Anu and the buddhic pranava - the lower Brahman. The Purusha is an individual Atman. "The Atman creates illusionary forms in the Maya"(Atma-Puja). On the mental plane the influence of the "Kanchukas" causes another polarity - of buddhi and manas, the negative pole, the mental mind. Here has the influence of the SELF caused a reverse creation, an individual shell, which is the basis of the evil forces (hinduistic Asuras) in this plane. Here is the Purusha an individual Atman.